This week we’re setting off from Hunter Park in Twyford to take in two of my favourite local trails. Mare Lane is a beautiful ribbon of twisting singletrack of perfect dirt that flatters everyone and will bring a massive smile to your face. White Lane drops from the top of the down to Hockley. This hollow way is a brilliant bit of trail with just the right amount of slope to make the descent a huge amount of fun. It’ll be led by Andy Whincup a British Cycling Qualified Mountain Bike Leader with years’ of experience riding and mentoring, so you know you’ll be in a safe pair of hands. You also know you’re riding with someone who really knows where to find the right riding for you. 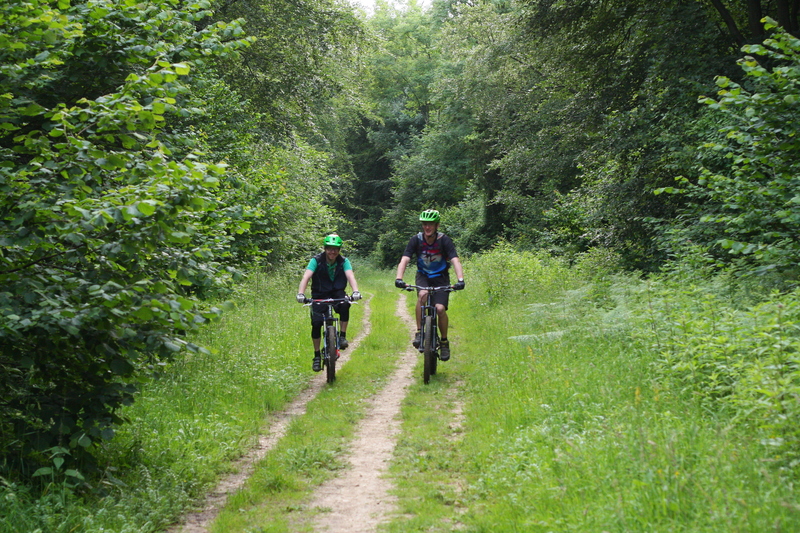 It’s a weekly ride that will take in some of the most enjoyable riding around Winchester. The ride will be deliberately aimed at those who are beginners or who need to build their confidence. Above all it’ll be good fun and a chance to meet and ride with new people. We’ll pass the Twyford Waterworks en route to Mare Lane, a beautiful ribbon of twisting singletrack. This is a downhill of perfect dirt that flatters everyone and will bring a massive smile to your face whatever speed you go. We’ll pass the Hazeley War Memorial to take in some spectacular views across Winchester, the South Downs and all the way to the Isle of White. The ride closes with the drop down White Lane from the top of the down. This hollow way is a brilliant bit of trail with just the right amount of slope to make the descent a huge amount of fun. It’s very much aimed at those who are just starting out mountain biking. The difficulty is deliberately set low enough for everyone to enjoy. If you think you lack fitness or confidence, then this ride is the ideal place to start. So come along and give it a try. You’ll get pretty beech woods dappled in green at this time of year. You’ll get historic sunken lanes. You’ll get twisty woodland singletrack that’s great fun to ride whatever speed you go. You might even get to see deer and buzzards or hear woodpeckers as you ride. What you won’t get is anything steep either uphill or downhill. Nor will you encounter any busy roads. So you can relax and enjoy yourself. We’re meeting at Crab Wood Car Park so you either drive or ride there. Give me a call if you want advice on the best way to ride. It’s on Friday 5th August at 10am. We will be back at the car park by 11:30pm at the latest.